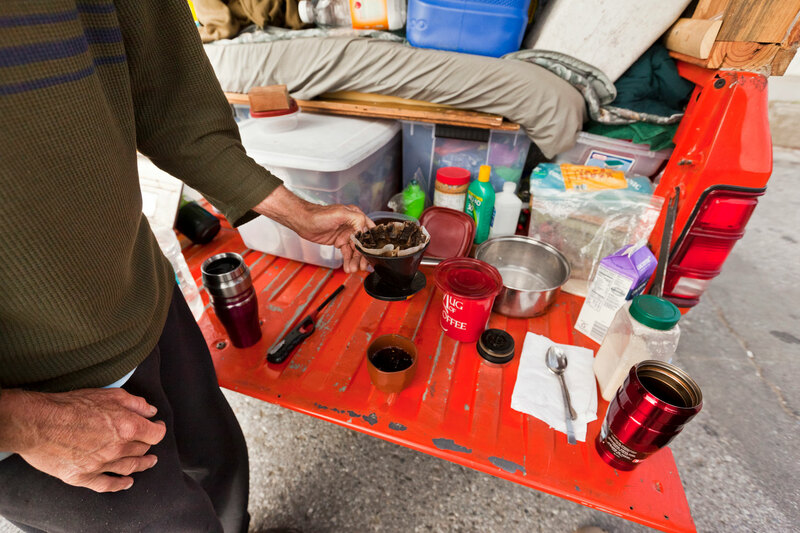 Jay makes coffee on the tailgate of his truck in a beach parking lot in San Francisco, California. Jay and Catharine met in New Orleans 35 years ago and have been living in a wooden cab Jay constructed himself and affixed to the top of their orange pickup truck. For the past year they have been traveling, cooking, sleeping, and making tie-dye clothes out of their vehicle hoping to stop in all 48 states. Their main source of income is from social security but because their cost of living is so low, they don't need much to survive day-to-day. If they run out of money, or have an unexpected vehicle repair, they apply for simple side jobs wherever they land.